Has your purchase funnel got a leak? 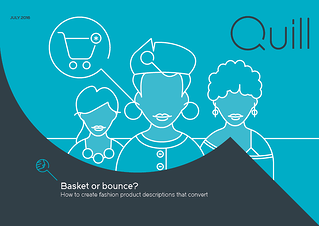 In our 'Basket or bounce' report, we reveal the formula for creating high street fashion product descriptions that convert, and the essential information that consumers are looking for to convince them to buy. 71% of consumers prefer descriptions that explain the benefits of the product. Is your product content hitting all the right marks with your customers? Download the report to learn how to supercharge your descriptions for conversion.